Wow, Great Hill Top Scenic View, Older, but a very solid 3 Bd. 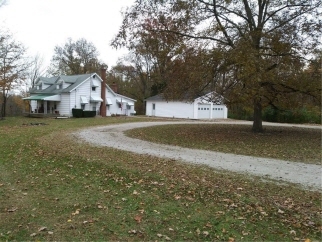 Rm , 1-bath home on approximately 20 acres. Home has a large family room with gas fireplace. big dining room, Master bd. rm. on main level, 2 Big bed rooms upstairs, Attic storage. Partial basement, and a lot of square footage for your family. Newer roof. New Range/Stove. Big covered front porch. 24 x 36 garage with door openers, Circle drive, Nice yard, Wooded with a creek and lots of wildlife. And A little tillable land, Partial flood plain, But not where house is. Close to Cloverdale, easy commute to Indy or Terre Haute. $169,900 . Another 32 Acres available across the highway. $149,900 Call Ron Smith at 317-445-5922 for more information.